The travel to and from the Philippine Eagle Center in Malagos was really a tiring one. 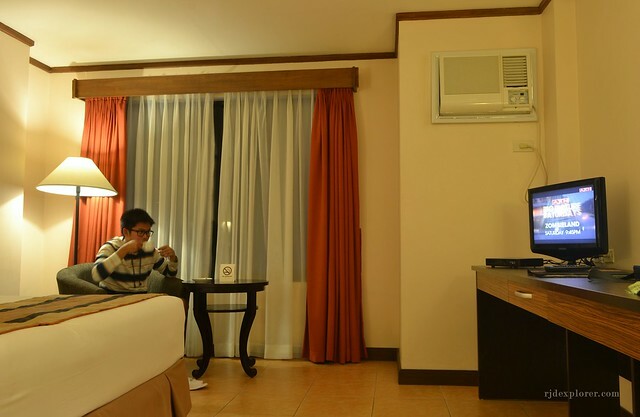 I made my way to Lanang for my third accommodation on my first Davao trip, Hotel Tropika. From the city, I found myself transported from a busy road to a tranquil, lush landscape. So be it, Hotel Tropika is a destination within a destination. Main door reminds me of home then the warm and spacious lobby will welcome you afterwards. The staff at the frontdesk said her usual welcoming rituals and added that they were already expecting me hours ago. I thanked her for her concerns and said that I just arrived from the Philippine Eagle Center. She handed my key, after I filled in the necessary details needed, and called a butler to lead me to my room. Hotel Tropika is home to 30 guestrooms, either with king or two twin beds, having plush linens and fluffy pillows. 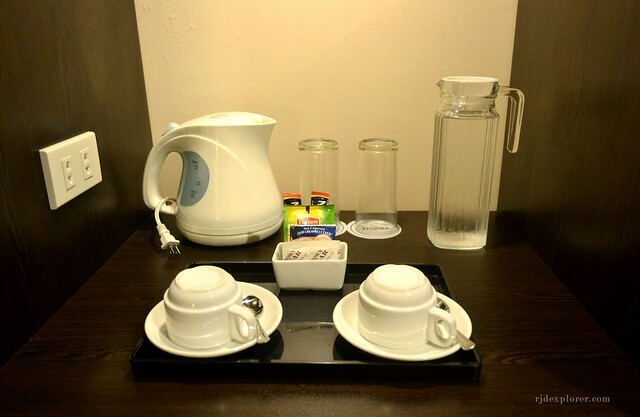 The fabulous designed deluxe rooms have a full array of amenities from coffee and tea making facility, fridge, the semi walk-in closet, flat screen television, individually controlled airconditioning unit, and an executive writing desk. 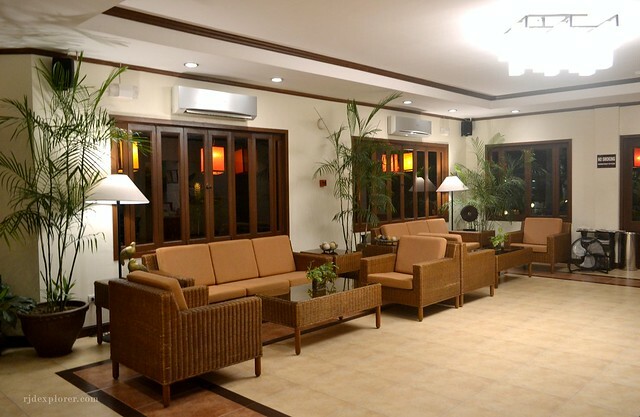 To create a warm and tropical vibe, they maximized the lamp shades to brighten up the room, there were no florescent bulbs installed on the ceiling. Staying inside the room was a comforting and restful experience either couching on the bed or lounging on the living room set. The bathroom has no bathtubs, but what really thrilled me is the full-sized vanity mirror perfectly covered a side of the wall. 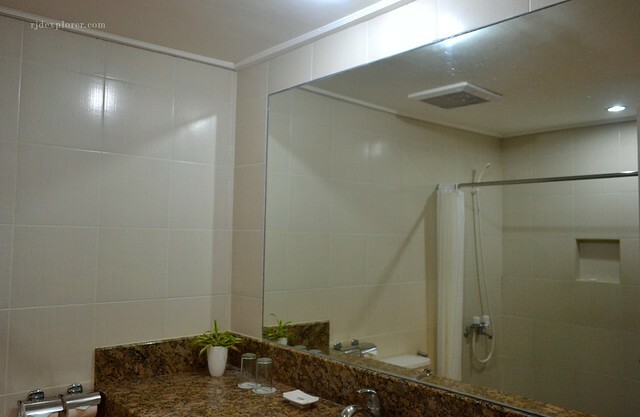 It is also equipped with hot and cold shower and has premium bathroom amenities. 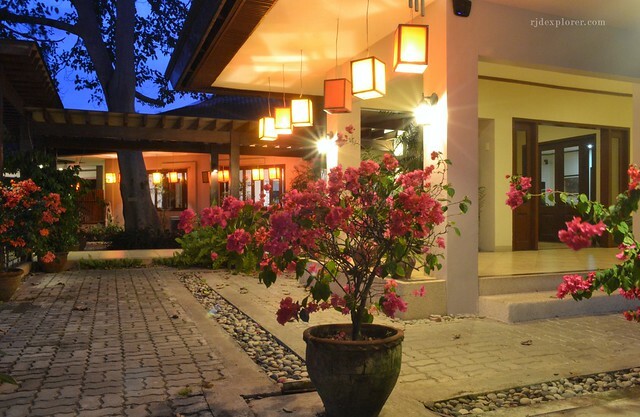 Hotel Tropika is literally within a lush surrounding with the presence of numerous trees on its perimeter. You can feel them, with the mellow wind, on a great morning while having a hearty breakfast at Café Aseya. 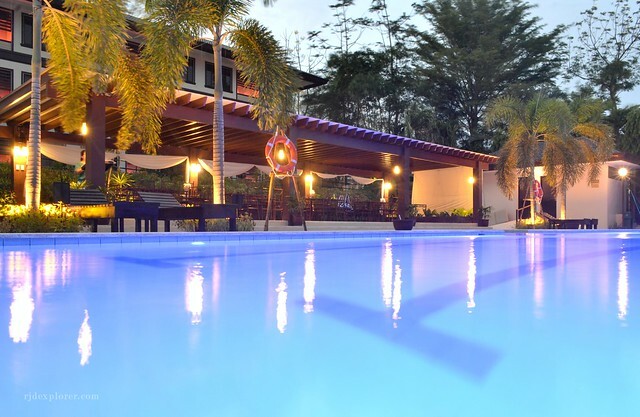 Café Aseya has limited tables inside but you can have an al-fresco dining experience in front of the garden with the view of the garden and the pool. It has several options to cater from Thai, Filipino, Japanese and Vietnamese gastronomy. 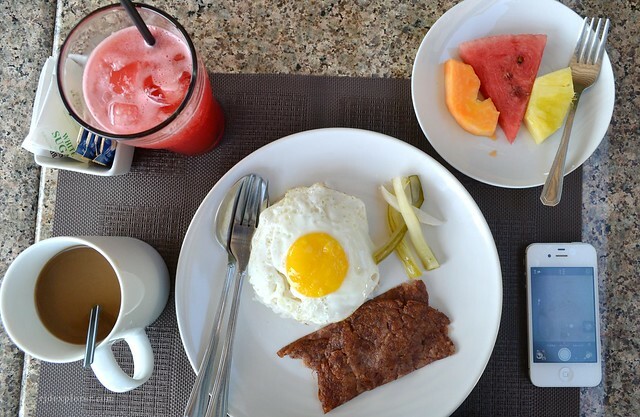 On that one fine morning, I had a Corned Beef Hash, fresh fruits, and one of the freshest watermelon juices I have ever tried. Aside from the homey room, you can’t also decline the 25 meter pool that is ideal for short lap swims. For a non-swimmer like me, the 4.5 meter deep pool-water is on my favor. 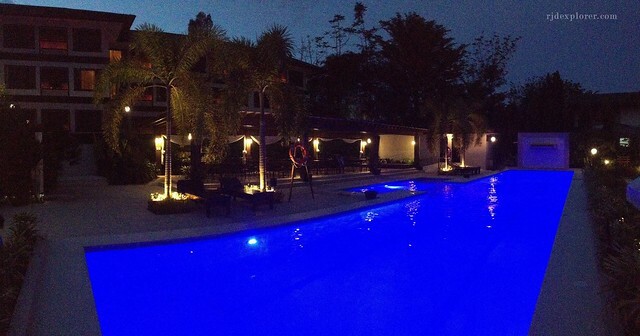 At night, you’ll be amazed by the changing color of the pool that will definitely entice you to take a night plunge. One thing I hope they could do is to have a counter near the pool with a staff that regularly attends the needs of the guests using the facility. 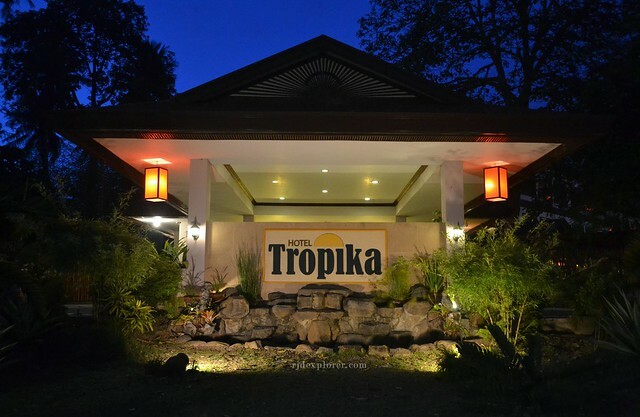 Hotel Tropika is also the usual venue of weddings, debuts, and other gatherings with the wide function halls, conference rooms, and garden areas. For business travelers, they support a business environment with the round the clock services like scanning, photocopying, printing, fax, and audio-visual equipment usage. 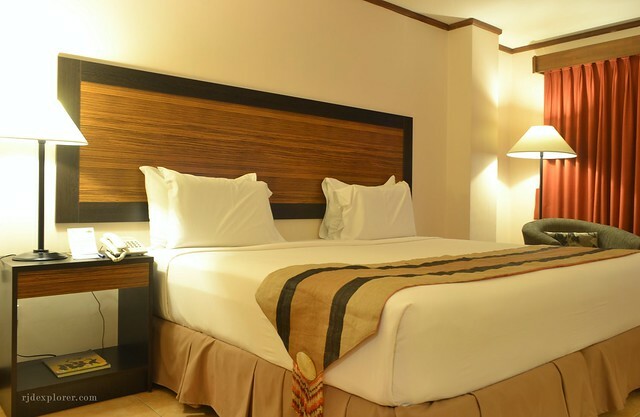 The main goal of the hotel, to provide comfort and restful stay, was achieved and I can attest to that based on my stay. Hotel Tropika is indeed a destination within a destination and staying at the hotel will put you in a state of longing and asking yourself when you are going back. 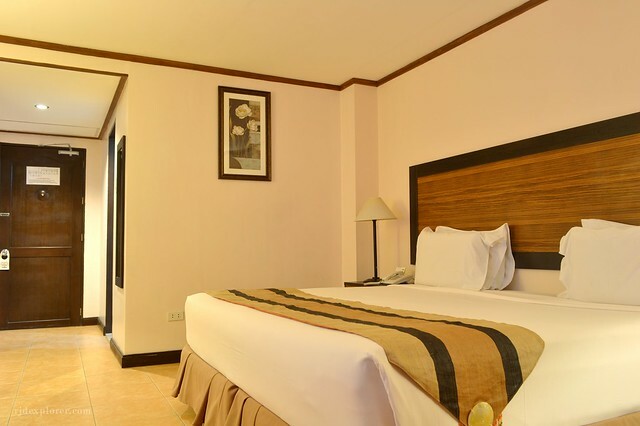 Experience the lush surroundings of Hotel Tropika Davao by booking a room here.